F.W. Hipkin’s head office is based in Chadwell Heath, Essex where we operate the Sales Office and the Warehousing and Distribution of over 8,000 regularly stocked product lines from over 90 manufacturers. The company was first founded in 1890 by Frederick William Hipkin in the days of horse and cart deliveries. Beginning by supplying merchants with general ironmongery it wasn’t until the 1930’s that the company began to trade in plumbing supplies. The company was bought by Frank Lafford in 1997 from the Hipkin family and to date has been expanding the company whilst still being run as a 100% family owned business with old fashion values regarding service and dedication to forging lasting relationships and constantly improving its service and product offering. The company now operates with nine Sales Reps nationally and a total of 48 staff across business serving in excess of 1,000 customers nationally. With over 50 employees across the UK we supply all leading brand plumbing products to merchant customers nationwide on a next-day basis. 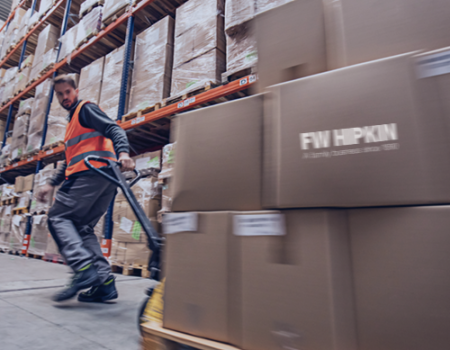 At FW Hipkin we are constantly sourcing new and innovative products with our distribution centre in Dagenham fulfilling over 450 customer orders daily across an average of 4,000 pick and pack lines. From underfloor heating design to site deliveries, we listen to the needs of our customers and react accordingly. We work closely with leading brands to bring you the best products available. To view all of the brands we stock view our catalogue.